I’m considering filing a restraining order against March this year. 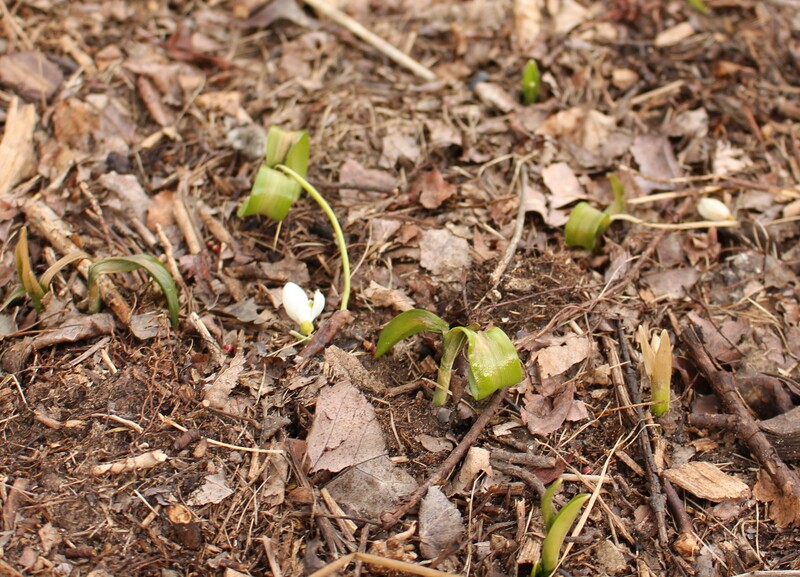 Every spring-like warm spell brings the hellebores and snowdrops on a little further along but then some new brutal weather event comes by to smack them all down again. It’s clearly an unhealthy relationship but I just can’t move on. Every time the sun comes out again, spring becomes so real I just want to forgive and forget and say just one more chance. Possibly my favorite snowdrop, ‘Brenda Troyle’ looks extremely average but it’s also so reliable and perfect I can’t say a single bad thing about it. Most of the snowdrops were lost after the first chance for spring came and went, but a few hid here and there either underground or cozied up to the house foundation. A shame they didn’t warn the hellebores about how fickle the season was being. The hellebores which could have been. I admit I’m not much help in protecting things. A few snowdrops received a plastic tub or bucket cover for when the thermometer dropped to 7F (-14C) one night, but most things are on their own. Galanthus lagodechianus tried hiding underground for a while and did manage to avoid the hail, but then came up just as the latest arctic blast was about to hit. Fortunately a simple cover saved its perfect flowers from damage and at least this week I’ll be able to enjoy the yellow coloring which is exceptionally bright this spring. The various snow crocus in the meadow garden are always a risky bet so I can’t complain much here. The weather gets whatever the rabbits didn’t so even in a good year you need to be quick. Some warm sun might be too much to ask for. 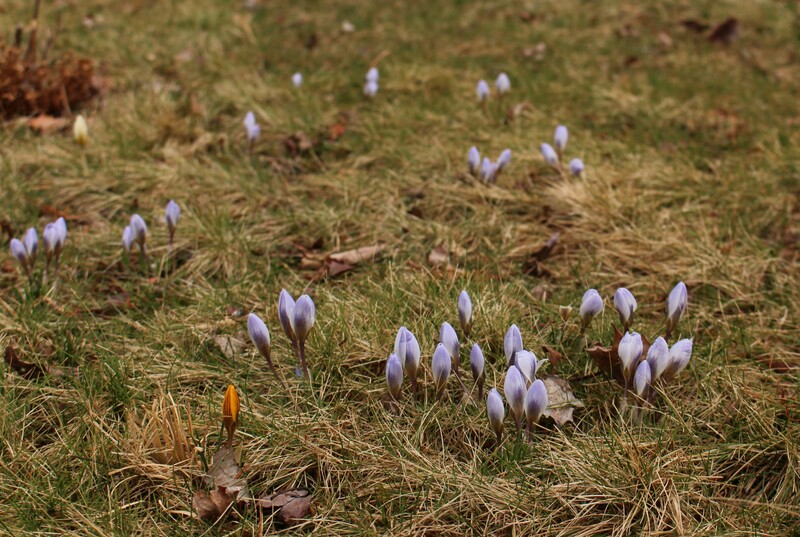 I keep waiting for the spring where I see a whole swath of opened crocus basking in the sunlight… but it hasn’t happened yet. To hedge my spring flowering bets I went around yesterday and plucked any undamaged hellebores which were still around. A few remained and they were enough to remind me why I still bother growing them…. since last year’s season was mostly a bust as well. Snuggled up right next to the porch foundation, hellebore ‘Cinnamon Snow’ has actually flowered well this year. Usually the buds are killed much earlier in the winter and never make it to this point. Wish I could say the same for the others, but this small handful were the only undamaged flowers I could rustle up. Hopefully the rest of March is a little gentler on the hellebores and the later flowers can still develop and put on a show. It would be nice to see a few showy clumps instead of the wilted and blacked stalks I’ve been getting used to seeing. Fingers crossed that this is the last of the hail damage. At first the magnolias didn’t look so bad, but once the damage started to brown it was a different story. Fresh foliage will make this all a memory in a few more weeks… I think. One last complaint. 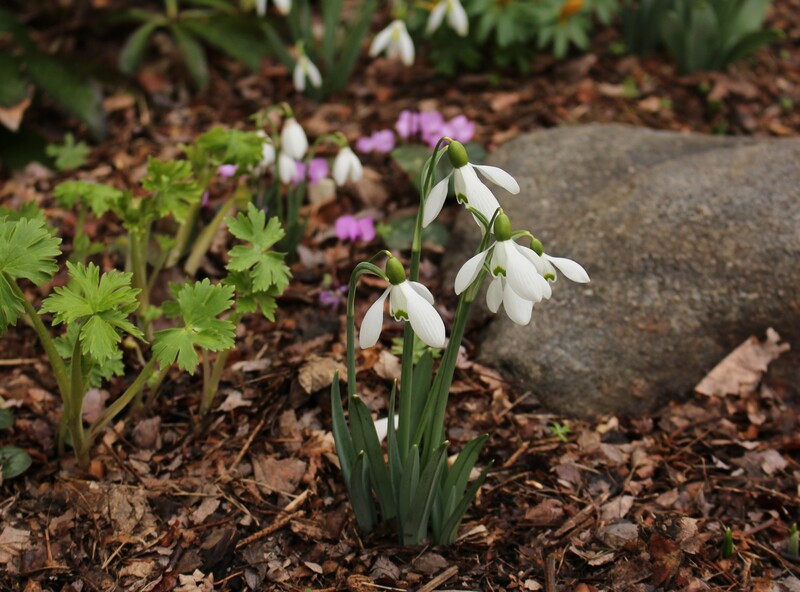 For some reason these snowdrops (G. woronowii) really took a beating from the cold. Maybe it was the 62F to 7F drop in temperature, or the wet soil, or the exposed location, whatever the case I think a few might not be salvageable. Sad seeing freeze damage on a snowdrop but it’s not my first time. Maybe a few will survive, but they (and about 200 others) were looking so promising for their first year. I guess some days it’s just better to stay indoors. The indoor garden should really have many more seedlings getting size on them for spring planting, but for whatever reason I just haven’t yet been in the mood to tackle a whole under-lights seed agenda this year. I planted onions, that’s it. Good thing the primroses are filling in and starting to flower. 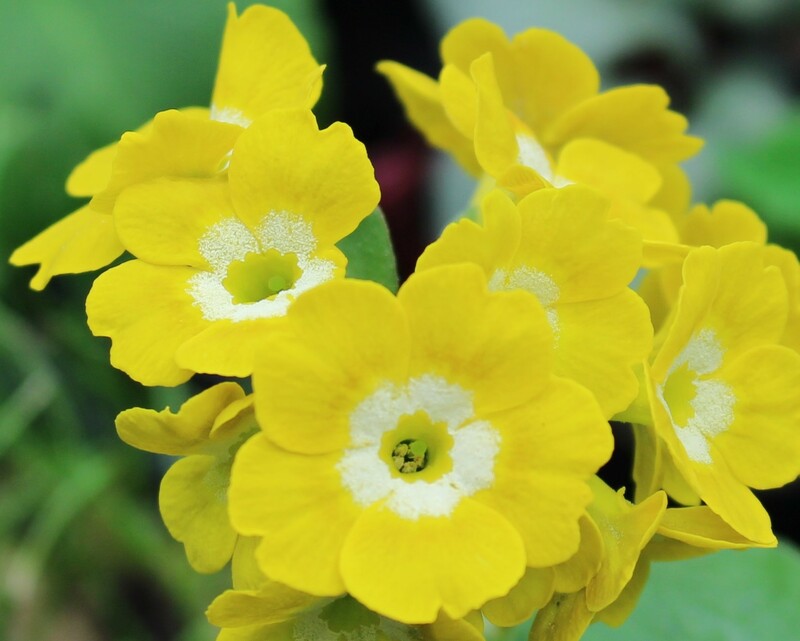 Photographing yellow is still a sticking point for me, but hopefully this picture still gets across how nicely this primula auricula has done. 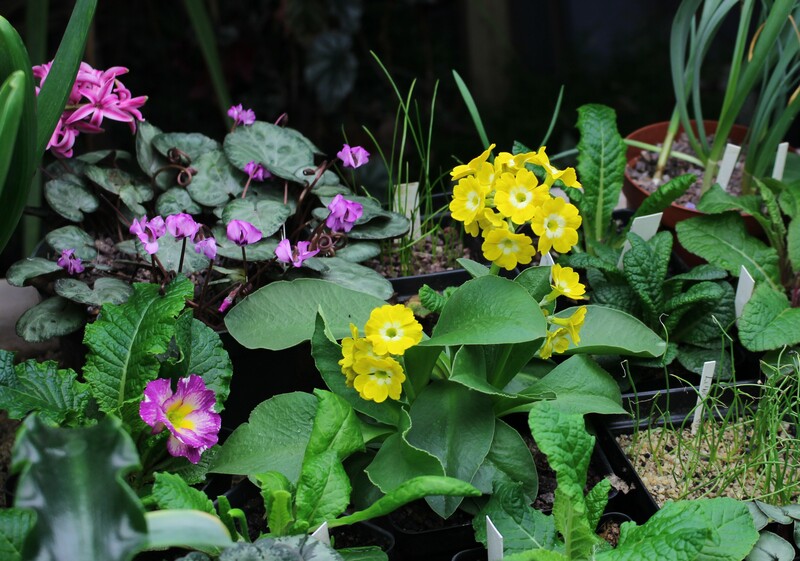 Having my yellow Primula auricula survive for a second year was a surprise in itself, but the fact that it’s actually multiplied and flowered again is borderline unbelievable. I still think the mealy powder on these flowers is one of the most exotic things. These indoor flowers will have to keep me and most of the East coast going for the next few days since March just decided to come back and slap us with a surprise snowfall. Normally this would be another reason to complain, but at least snow should insulate things for the temperature drop which will follow. 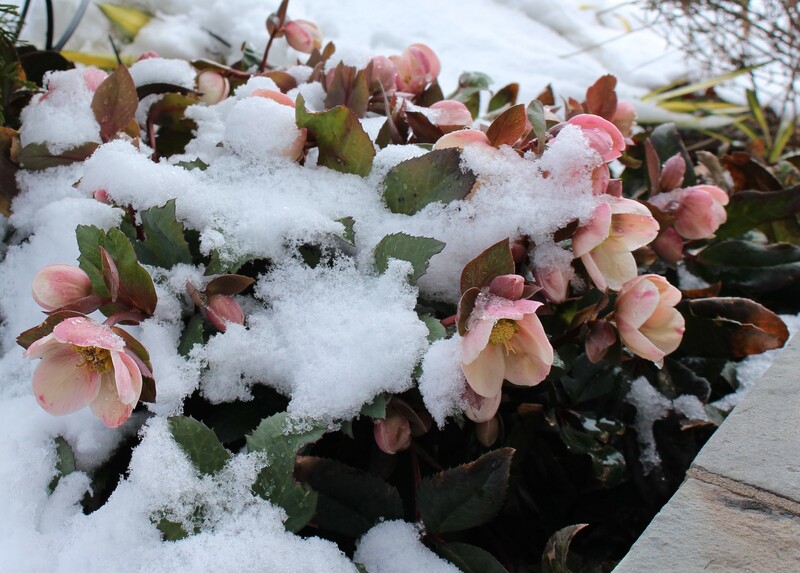 Hellebore ‘Cinnamon Snow’ in the actual snow. Temperature drop and then more snow. Right now they’re saying lots more but given the forecasting track record it’s still too soon to tell. Wouldn’t that be something though if we get more snow in the first few days of spring than we did all winter. March must know I was planning on a garden visit next weekend because I bet this weather forecast is what jealously looks like. Stop it March! 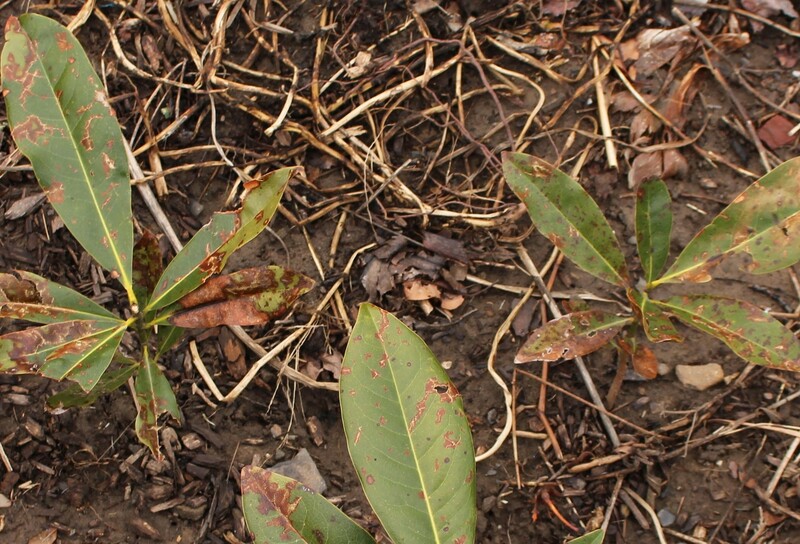 This entry was posted in early spring, freeze damage, growing under lights, hellebores, late winter, snowdrops, winter flowers and tagged garden, hellebores, pennsylvania, spring. This is the first time I’ve had lots of damage to hellebores. There were several bouts of driving wind and rain and those that weren’t in a protected place really got beaten down. Now there are several inches of fresh snow. I don’t know what they’ll look like once this week of freeze and storms is over. I hope your hellebores rise again, it’s such a shame to lose them just as the season is starting. At least the snow should make for a nice insulating blanket. Mine usually take a beating so I’m sort of used to plenty of ups and downs and a few damaged flowers each year, but last year was so bad I was really looking forward to an exceptional spring. Who knows, it may still happen! ‘Cinnamon Snow’ is a truly gorgeous hellebore, Frank. Thanks for sharing it with us – and the rest in your little handful! Surprising about the snowdrops suffering, I always imagine them, of all flowers, to be perfectly adapted to changeable weather. The auricula is perfect – and you photograph red better than I do! Hope the weather is not too unkind to you. I guess there’s only so much even the hardiest of plants will tolerate! -and I’m also not ruling out some other bad site prep or planting issue since this is their first year in the location. Again, a stunning blog with all sorts of talking points and things to envy, or rather seek to emulate. The yellow snowdrops are very bright indeed and yes they do vary in intensity, year on year. “Brenda Troyle” and the similar “Sam Arnott” are very early for me and have long since given up the ghost. The yellow colouring looks fine to me from my side of the Atlantic. Thanks for the kind words Ian. This winter I was wondering why I bother keeping up with the blog and then realized it’s for these interactions! Sorry your weather is so bad and unpredictable. So sad the snowdrops have been badly hit. I am always amazed that you try to garden at all. I wish I could send you some of our sunshine although I wouldn’t wish our wind on anyone. I think we all have our share of weather headaches. I used to garden in Texas, a much warmer climate, but oh my the pests and pestilence which would attack the garden and gardener. But it only takes a few amazing moments to forget all the troubles! That is very true, and a good job too or maybe we would just give up. Oh Frank, you make my complaints about constant rain seem minor in comparison. I do hope Spring finds you soon. Still you have lots of lovely floral glimpses. I love your Cinnamon Snow. A few decent flowers on the hellebores and I want to plant them all over! I feel your pain and then some. I’m supposed to talk in Ithaca Wednesday afternoon and they are saying 8-12″ the day before and another 1-3″ the day of. We got down to 3°F last night and -9°F a week ago. You’re no stranger to weather mayhem 😉 I hope Wednesday goes well, here they’re still back and forth between snowmaggedon and just a few inches. School will be canceled I’m sure, it’s just a question of one day or two. I’m really glad for these last few inches, I think they’ve saved quite a few plants from a blackened death since these last few nights have been awfully cold again… but nowhere near a cold as what you’re seeing! Hang in there, these must be the death throes. 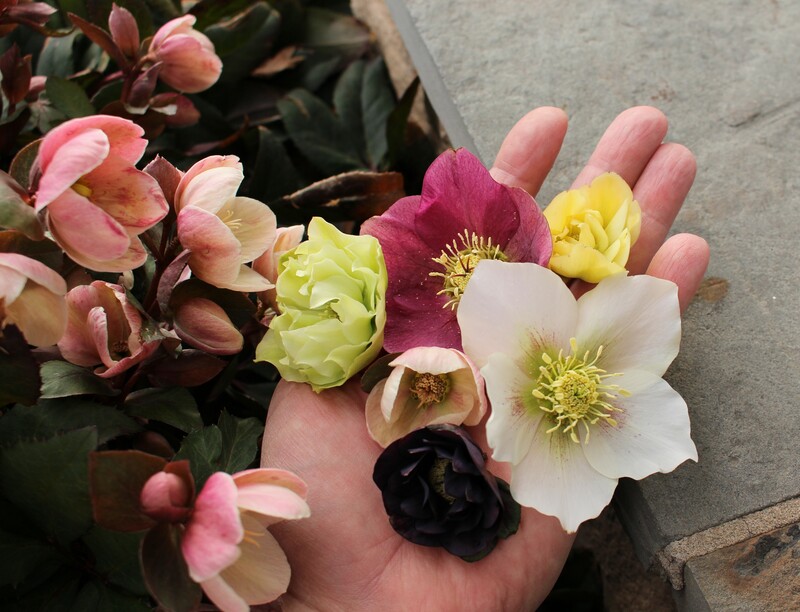 Your hellebores are lovely, especially Cinnamon Snow. I hope they survive the cold spell. Mine are only just starting to open, but I think our winter is over now. 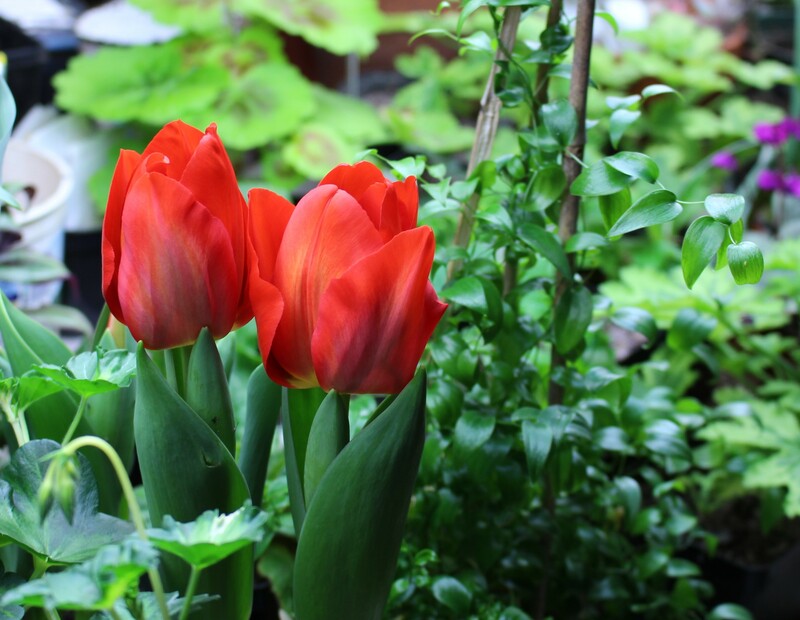 Your indoor garden is wonderful – a real booster when the weather gods throw a tantrum! I hope that when we make it through this last bout of winter it will be all smooth sailing where the magnolias can flower in peace and the tulips shine in the sun! The trials of a Northeast gardener! (sigh) At least your indoor garden gives you some consolation. Yes it’s weather like this that makes me reconsider planting so many early bloomers… but I guess things are just as likely to go wrong in July! This is the third year in a row there’s a threat of a blizzard during the Philadelphia Flower Show (the only reason I remember its’ been the same time each year) after unseasonably warm weather that brought out many of the bulbs in the garden. 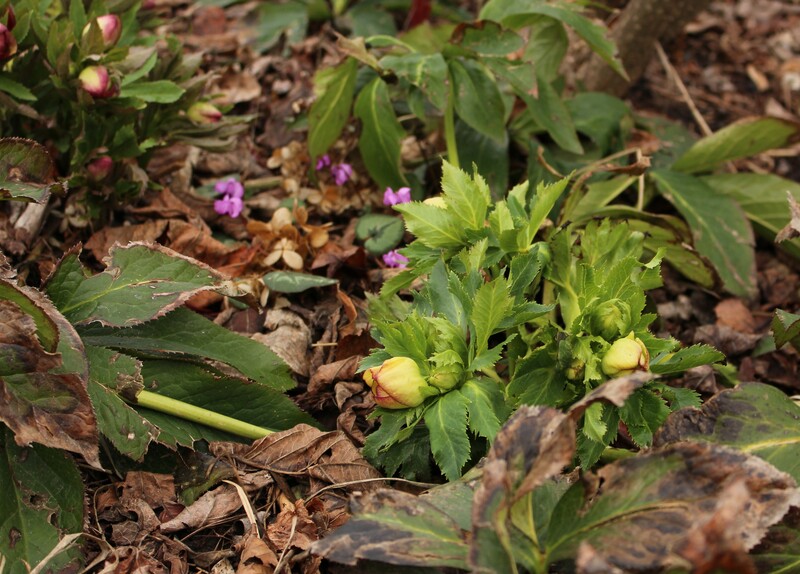 My lone hellebore had beautiful blooms, finally, and then got the same damage yours did. I keep wondering if this is the new normal for winter. We’re back to 2 days of snow after too much crazy weather. Trying not to think about damage. Too depressing to wait all winter and then lose the spring blooms. Love that yellow snowdrop; well worth protecting. 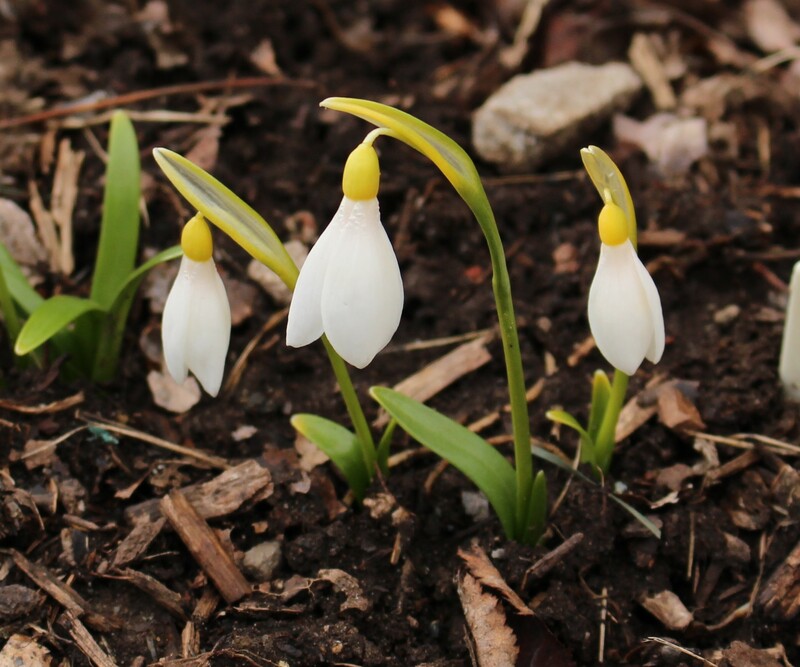 Wait, what – does Galanthus lagodechianus normally yellow for you? So far it has, it’s not as bright as some of the other yellows but I count it! I had heard there was a yellow form but this one was bought as the straight species. You got @ Hitch’s – right? – last time we went together, coz I have one from him. Well it’s multiplied into several now which is great. Wow! I did, it was a 2015 order and has come up yellow both springs since. I like it more and more each year but it’s hard to photograph, almost as if it’s too white!